German researchers used a CT scanner and a 3-D printer to make a copy of a dinosaur fossil that's been wrapped up in protective plaster for decades — and the real trick was that they could do it without ever cracking the plaster open. In this week's issue of the journal Radiology, they report that the technique could be used to study — and share — objects that are too rare or fragile to be passed around. "The most important benefit of this method is that it is non-destructive, and the risk of harming the fossil is minimal," Ahi Sema Issever, a radiologist at the Charite Campus Mitte in Berlin, said in a news release from the Radiological Society of North America. "Also, it is not as time-consuming as conventional preparation." Fossils are often wrapped in plaster casts, or jackets, to protect them from damage during transport or storage. To study the fossil, researchers typically have to remove the plaster as well as the sediment surrounding the specimen. But what if you don't know exactly what's inside the plaster? What if you're reluctant to risk damaging the wrapped-up fossil? CT scans have been used to trace the structure of dinosaur brains, look at fossilized whale bones inside their plaster jackets and make out the face of a 49 million-year-old spider wrapped in amber. So it's wasn't that much of a stretch to use the technique on a mystery fossil from Berlin's Museum für Naturkunde. The fossil, hidden in its protective plaster jacket, was part of a collection that was buried beneath piles of rubble in the museum's basement after a World War II bombing raid. Some of the scrambled-up specimens have been difficult to identify. So Issever and colleagues took one of the unidentified chunks of plaster and put it through their CT scanner. The plaster, sediment and fossilized bone absorbed X-rays differently — yielding a clear picture of a dinosaur vertebra inside. The researchers matched up the picture with a sketch showing fossils from an excavation that was conducted from 1910 to 1927 in a clay pit south of Halberstadt, Germany. They could also see that there were multiple fractures and damage to the front rim of the vertebra. The detailed rendering from the CT scan was then fed into a 3-D printer, which created an accurate reconstruction of the fossil through selective laser sintering. It's not uncommon to see reproductions of dinosaur fossils. The best-known dino-copies include plastic reproductions of Sue, the multimillion-dollar Tyrannosaurus rex skeleton that's on display at Chicago's Field Museum. But advances in 3-D printing are likely to make faux fossils much more available and much less expensive. "The digital dataset and, ultimately, reproductions of the 3-D print may easily be shared, and other research facilities could thus gain valuable informational access to rare fossils, which otherwise would have been restricted," Issever said. "Just like Gutenberg's printing press opened the world of books to the public, digital datasets and 3-D prints of fossils may now be distributed more broadly while protecting the original intact fossil." 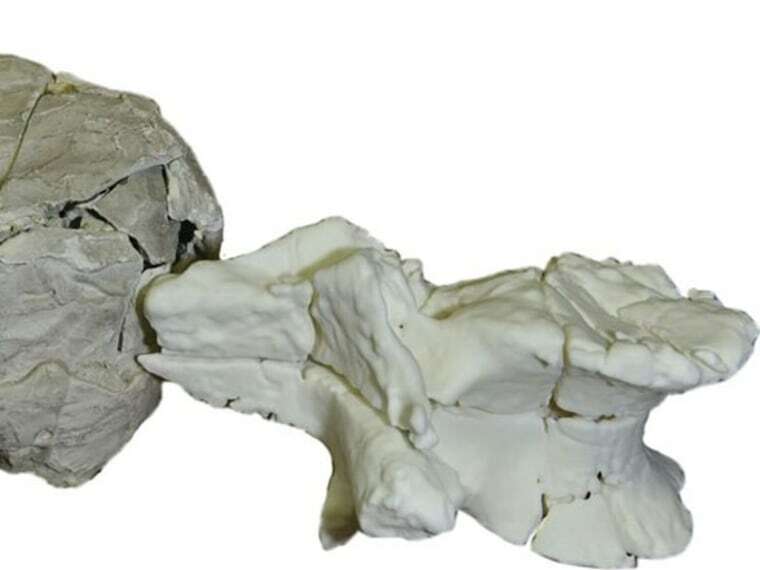 In addition to Issever, the authors of "Reviving the Dinosaur: Virtual Reconstruction and Three-dimensional Printing of a Dinosaur Vertebra" include Rene Schilling, Benjamin Jastram, Oliver Wings and Daniela Schwarz.